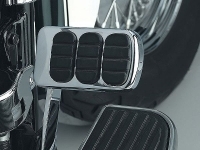 Highly chromed smooth clutch lever, adjustable in 5 steps. Easy installation, will simply be exchanged. Add the comfort of cruise pegs & keep that clean simple style with these Adjustable Cruise Pegs Mounts. 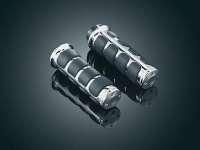 These little beauties bolt directly onto your floorboards & allow full adjustability for optional foot positions. 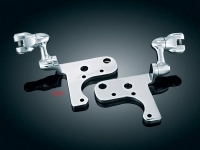 Add any of Küryakyn's Male Mount Pegs & ride on! 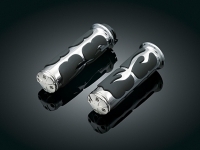 The perfect item if you already have ISO-Grips or floorboard covers on your bike! Easy installation, though instructions have to be read carefully! 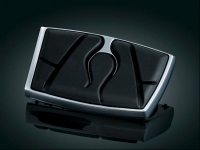 The perfect item to compliment your ISO grips or to just make sure you don´t lose your grip on your brake pedal. Easy installation, but brake pedal has to be drilled once. Use P/N # 8857, if your brake pedal rubber has two screws from the bottom. Use P/N # 8850, if your brake pedal rubber is fixed with a single screw. Your pedal does NOT need to be drilled! Simply get some 2K metal glue and glue the pedal pad onto the stock brake pedal after removing the rubber - and there you go! If you’ve already started the fire with our Flamin’ Footpegs and Flamin' Grips, stoke it up with the new Brake Pedal Pads. These latest additions to this fiery collection feature the same tough die–cast construction & brilliant chrome finish. All rubber components are physically retained - no more glued on pads.